Mary (3/28 post), Sara S, Kristy D, Adam V, Tricia S, Mary A, Emmalee W, Juriana S, Krithika S, and Sara J. In order to qualify to win one of these subscriptions via this contest giveaway, you must complete the below entry task by Saturday, June 3 at 10PM EST. However, the sooner you enter, the better chance you have of winning, because we will pick a winner on TEN different days within the contest period, via random drawings, as listed below… So if you don’t win the first week that you enter, you will still be eligible to win during the following weeks until the contest is over. We will announce each week’s winner on Twitter @ClassicMovieHub (or this blog, depending how you entered), the day after each winner is picked at 10PM EST — for example, we will announce our first week’s winner on Sunday April 2 at 10PM EST. Why would you like to win a subscription to this service? Please note that only United States (excluding the territory of Puerto Rico) entrants are eligible. And — BlogHub members ARE eligible to win if they live within the United States (as noted above). This entry was posted in Contests & Giveaways, Posts by Annmarie Gatti and tagged Free Subscription to Warner Archive Instant, Warner Archive Instant. Bookmark the permalink. The Warner Archive has a fantastic library. I’ve had a great experience with their DVD on demand service, and their blu-rays have beautiful picture quality. I’ve long been interested in their streaming service, so this sounds like a perfect opportunity to sample it. I would love to win a suscription to Warner because as a studio it produced many films of incredible quality, many of which my wife and I have not seen yet. We visited the studios back in 2009 and took the tour around the entire lot. Thank you. I would love to win this subscription. I had one with ClassicFlix for a while and was able to watch so many films I didn’t have access to otherwise. Unfortunately, due to finances I had to cancel it. There are quite a lot of Warner films I would like the opportunity to see. This is truly a wonderful subscription to have. I’ve only explored it a little so far, but it is a treasure trove 🙂 Thanks so much for entering and Good Luck! Winning access to that fabulous Warner archive streaming service that has over 800 classic films and television shows is like hitting the “gold mine” jackpot! What an absolute STUNNING prize!! I turned off my TV back during the week of the Boston Marathon bombing, though not tied to it for any reason. Mainly because I couldn’t justify the cost for the lack of quality. So the library, Half Price Books, and Amazon have been my sources for movies plus the ones I’ve won here. As you know that doesn’t nearly cover the breadth of what is offered through Warner Archive subscription. So this would be hitting the Jackpot!!! I may not go out for a year. Let the party begin! Just clicked through the current offerings!!! For sure Dr. Kildare, The Little Rascals, Tarzan, The Hand, and all those GREAT actors of the time, and Viva Knievel! =) What a treasure trove! Indeed a stunning prize, and I was so excited to be able to offer it 🙂 And glad Warner Archives gave us 10 to give away… that’ll make for some happy fans. Thank you so much for ALL of your support and Good Luck! I’m currently glued to my tv constantly watching TCM, but I wish I could bring my tv with me… rather than being a couch potato I’d love to be able to work out and watch my favorite leading dames! I get my movies from a variety of sources: TCM, the library, Netflix, YouTube. It would be great to win a subscription to this!! Wow! Warner Archive Instant sounds amazing with access to over 800 classics. I would love to explore films I haven’t seen to find new favorites! i love old classic movies. i studied them back in college and i knew this was something i was very interested in. i love the history behind the movies and how they are made. just digging deeper into a classic movie is so interesting. having this subscription would be so fun to watch old movies and tv shows from way back when. i read about movie history all the time and its so interesting. I would love to win this subscription because, I wish to see classic films and shows that I remember.plus, I would love to experience and see the classic ones that I have never seen. I would treasure and cherish this opportunity to receive this wonderful gift.please choose me as one of the winners. Because there are so many classic movies I need to catch up on! There are so many reasons why i would love to win this, but I guess it breaks down to simply being in Heaven for a year. I don’t sleep much and quality movies are hard to find without spending an arm and a leg. I love TMC because they do have so many choices, but it is still rather limiting when you are looking for a different genre or such at the time. I would like to win the subscription because I could watch classic movies on my iPad, and not just my favorite movies, but I could also discover movies I’ve never seen before and finish those movies I haven’t finished yet. I do have Twitter. My Twitter handle is @zepporella. I’d like to win the subscription because classic movies are so much better than movies released today. I’m frequently tuned in to TCM, but they can’t possibly show every movie that’s been made. What better way to expand my movie database than with Warners streaming service. I would like to win this service because I KNOW they have Great show content! Thanks ! My wife and I love spending the weekend watching classic film. And now that she has retired she enjoys them even more. When our grandchildren spend the night we all enjoy watching the classic. My grandchildren love the old black and white film best. This would be a wonderful addition to our family. These days it seems there’s an unlimited amount of streaming services for various movies and TV shows, but none cater as much to the classic movie fan as Warner Archive Instant does. With this subscription, I’d be able to discover old gems or revisit favorite movies without having to search high and low for them or to wait for certain titles to pop up on TCM. I would love to win a subscription so that I could enjoy some of the amazing features they have in their catalog! More movies is always a good thing, plus streaming would save me $ on getting discs. I would like this prize because I like watching old movies. Hi Brad, please don’t forget to tweet. Thanks! I’m having trouble doing this tweet. How do you tweet the exact quote? I have made a draft and then I can’t find it to tweet. I’m sort of computer tweet iPhone illiterate. No problem Brad. You are officially entered now. Thanks! i would like to win one of the subscriptions, because classic movies are my life. like many of my generation, i was raised by television/movies. for years, i dreamed cary grant or robert mitchum was my father. they weren’t. I can’t get enough of classic movies! They just don’t makes movies like they used too! And some of them are very hard to find! There are so many classics out there that are too hard to get a hold of and this would be a great way to catch up without spending every free dollar I have (though it would be worth it)! Other streaming services just don’t have the classics like some of these oldie-centric services. When I first cut the cord, Warner Archive Instant filled in the huge gap left by no longer having TCM – but alas, once I became unemployed my subscription went by the wayside. Now that there is significant interest on the part of Warner to revitalize the service, I need to get back in, as it’s been way too long. 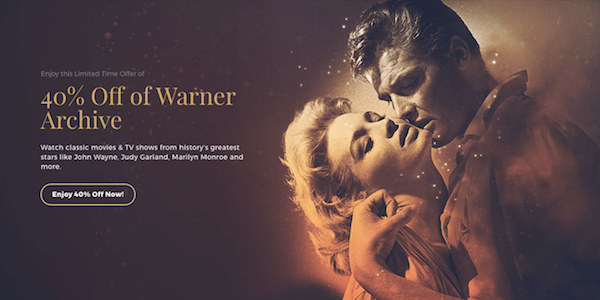 Nobody else offers the kind of library Warner has (though Amazon, Fandor and FilmStruck all have excellent libraries, when it comes to major Hollywood history, that is not their forte). And the prints are great! I would love to have access to all those classic movies from the Golden Age of Hollywood, where actors/actresses were true stars .. larger then life even .. they were untouchable at that time. With the age of social media and internet .. that has been greatly diminished . Hi Corrine, please don’t forget to tweet the message, and if you don’t have twitter, please comment back here to let me know. Thanks! I have looked over the catalog of titles, and I notice quite a lot I have seen, and quite a lot I own, but also a number of things I haven’t. I am aware that they change their streaming offerings, so I’m interested. I also own a Roku box to view it on. Warner Instant has a lot of interesting titles in its catalog, and even though I’m not huge on streaming, this still sounds pretty cool. Classic movies are way before my time. The classic are the memories we never forget where we were the first time you saw it. The way you felt. The tear that fell or even the laughter it brought to you. I would love to win and have those feelings again and again. Hi Cheryl, please don’t forget to tweet the message, and if you don’t have twitter, please comment back here to let me know. Thanks! I love watching the old movies. Alas, real life often interferes with my plans to watch great film classics: I have to work when TCM is showing something I really want to see!! Winning a subscription would mean I could watch any of hundreds of wonderful movies on MY schedule!! I’m a baby boomer so it goes without saying I grew up with TV, that being said I love movies. The older the better because they are classics. The sets, costumes, hair, makeup, lets not forget the actors….oh man the actors. Most may be gone but they live on in film thank goodness for that. The crews that all worked tirelessly behind the scenes should not be forgotten either. I live for classic films. They bring me joy and a light hearted break in my fast paced universe. Hi Janette, Can’t seem to find your tweet. Could you please confirm that you tweeted, or let me know here if you don’t have a twitter account. Thanks! I would love to win a subscription, because I would be granted access to tons of films I wouldn’t have had access to before. This would be a dream come true, & I would try to keep the films’ legacies alive. I would love it because it would free up space on my TiVo, which is full of movies I can’t stand to erase. Seriously, this sounds like an amazing service for anyone who loves classic movies. Winning a subscription to Warner Archive Instant would mean the world to me! They just don’t make movies like they used to. The Classics with Grant, Bogart, Sinatra, are like no other. I absolutely love the Classics and watch them daily. I adore Cary Grant and Doris Day. Hi Sami, Can’t seem to find your tweet. Could you please confirm that you tweeted, or let me know here if you don’t have a twitter account. Thanks! My mother taught me to love all these classic movies. I’m passing that love on to my kids (16, 10 and 10). I’d live to be able to watch all the great WB movies as a family. We haven’t had cable for several years, so my only source is the local library and they don’t always have a great selection. I hope I win! I would love to win this subscription! It would give me access to more classic films that I don’t have access to now. I love the classics and would certainly get great use of this Warner Subscription! You’d think with my job I wouldn’t need this, but I want a WA subscription so when it’s 2am and I want to watch S.O.B, I can. I would love to win a subscription because there are so many things I would love to see and so little funds to do it with! My life long dream is to watch all the classic films there are! So winning this would help fulfil my dreams! Because I’ve out-grown my public library’s meager selection of classics and am ready to dig a bit deeper. I would love to wn because Warner has some of the greatest movies and shows ever made. It would be so great to see this amazing entertainment whenever I want! Watching classic films reminds me of spending time with my grandmother, who helped raise me. I haven’t had cable in more than a decade, so I’ve not had an opportunity to sit down and watch so many films and share them with my son. I’d love to be able to spend the same kind of time with him that my grandma spent with me. Hi Jennifer, I can’t seem to find your tweet. Could you please confirm that you tweeted, or let me know here if you don’t have a twitter account. Thanks! I want to win because by following @NitrateDiva and @PreCodeDotCom on Twitter I’ve realized I know nothing of classic movies and want to fix that problem! I want to win this because I love old films. Warner Instant Archives has some wonderful films which I would love to see. I am a member of the Pure Entertainment Preservation Society, and we are trying to bring back the Motion Picture Production Code of 1930 so all films will be clean and wholesome like they were during the golden era of 1934 to 1954, the period when Joseph Breen protected the audience. I would love to win the subscription because it would give my family a fun, family friendly entertainment alternative to enjoy. My DVR is filled with TCM greats and literally there isn’t any more room for more greats. And I need to see as many as possible because, honestly, I’m obsessed with the classics. I think the older Classic movies are much better than the movies they have now. I do love the classics. Hi Mary, I haven’t seen your tweet yet. Please remember to retweet the entry message. Thanks! Oh my goodness what an AMAZING and GENEROUS prize! I would be over the moon to win as I love love love classic films so very much. I would watch daily if I’m a winner. Thank you for hosting! Cheers! I would love to win a subscription because some of these movies are hard to find anywhere else, and the TV shows are as well! I would love to win a subscription to Warner Archive Instant, due to their superb collection of oddball titles and lost classics. It’s an ideal resource for my blog! I would love to win a subscription because the Warner Archive is the only source for so many fabulous movies. Hi Shaula, I can’t seem to find your tweet. Could you please confirm that you tweeted, or let me know if you don’t have a twitter account. Thanks! Film always was a significant part of my life, and winning a Warner Archive subscription would be valuable in helping me gain and contribute to my film knowledge, and of course, allow access to TV and Movies I wouldn’t otherwise be exposed to. Also, I’d see this as a chance to sit with friends and family (especially my dad who is a huge western fan) and share the Archive experience, because for me, it’s always better watching movies with a crowd! My Aunt and I love talking about old movies. I love listening to her stories of the beauty and where she was or what was happening in the world when certain films came out. If they are drama, crime, film noir, I am in love with classic movies. I would love to win to experience these movies with her and learn more about the actors and stories behind them. To see the grace and beauty. Thank you. I watched a lot of MGM and Fox’s classic library on TV in the pre-TCM era, as well as at various repertoire theaters and high school/college classes. Plus having been born in LA and having some tangential connections via family to film history, it’s a topic I always come back to. So the Warner’s library is a big gap in my knowledge for the classic studio era that I’d love to have the opportunity to become more educated about. I’m always looking for new ways to watch content from my favourite genre. Winning this subscription would mean a lot to me because I feel like I’m one of the few millennials that truly appreciate the charm and magic of movies and tv from the golden ages. Hi Jaclyn, I don’t see your tweet yet. Please either tweet the message or let me know here if you don’t have a twitter account. Thanks! I would like to win a subscription to the Warner Archive Instant to expand the number of films I have at my finger tips. I am only 22 years old (a newbie to classics) and I have watched about 250 films. At the moment there are 50 movies in my DVR on my watchlist and I would love to add more films to that list. I would love to win this subscription because Warner has such a wonderful library and I would love to really delve into it. I would love to win the Warner movies not just because they are classics but because my daughter is a TV/Film major at college. We now watch movies from the technical perspective. Writing, editing, directing and acting are all appreciated in the film making process. I think this would be most educational for her. Thank you. Hi Maria, Please don’t forget to tweet the message, and if you don’t have a twitter account, please just let me know by replying back here. Thanks! To say I am a cinephile would be an understatement. I loves movies, all kinds. But I have a special fondness for older movies. Well as Robert Osborne had mentioned, not all old movies are classics but it doesn’t mean they shouldn’t be watched. Re-visting movies I have seen before or the chance to watch ones I hadn’t caught on air or in the theater is always a treat. The escapism factor alone is enough to make me want a subscription. Classic movies are my endorphins. Watching them makes me calm & relaxed after work. I especially like the Warner Brother stars and message movies. A year’s subscription would be like winning the lotto. The early films–talkies–are my favorites. Chatterton, Brent, Francis, Davis & the rest. The reason I wish to win is that the classic movies I remember watching with my Father-In-Law are not truly available anywhere else. I dumped cable so I no longer have TCM. I need my classic films!! Yes! We Love watching classics. Hi Maricela, I can’t seem to find your tweet. Could you please confirm that you tweeted, or let me know by commenting back here if you don’t have a twitter account. Thanks! My parents once asked me why I, a young(ish) person of color, watches so many old black and white films. What could these old films full of dead people possibly be of interest to me? I told them, those dead people really knew how to tell a story. They knew how to convey high emotion while being restricted from cussing. They knew how to convey passion without tongue kissing or removing a stitch of clothing. The boundaries they worked in made them tell more indelible – and more rewatchable- stories. Even someone like me, living years later in a different America, can relate with so many of these stories. They are timeless. Hi Marieann, I can’t seem to find your tweet. Could you please confirm that you tweeted, or let me know by commenting back here if you don’t have a twitter account. Thanks so much! I’d like to win a year-long subscription to the Warner Archive because I plan on becoming a film preservationist, and in order to become a proper preservationist I need to know about the history of American film studios; what better way to explore the rich history of the Warner Bros. studio than to go through their huge and diverse catalogue of films! Hi Sam, I can’t seem to find your tweet. Could you please confirm that you tweeted, or let me know by commenting back here if you don’t have a twitter account. Thanks so much! I love classic movies and would love to try this service. I do not have a Twitter account, so I am posting here to enter but cannot tweet the message. Would really like to see all the great classics on Warner Archive!!!!! I do not have a Twitter account, so I am posting here to enter but cannot tweet the message. I would like to win this because it would give me an opportunity to revisit many of my favorite classic films and while simultaneously giving me an opportunity to see new favorites. I am a classic movie BUFF. I could sit all day and watch classic films, from Bette Davis to Joan Crawford, Cary Grant to John Wayne. I love them all. Classic films have all the wonderful elements, great writing, superb acting and such memorable moments. I would love to be able to watch them on Warner Instant Archive. I have had Warner Archives for about 2 months now and it has not disappointed me. There is always something great to watch. The variety of actors and classic movies is unsurpassed!! I am loving this channel!! The long history of great movies and later great television shows that have come out of the Warner Bros. Studios is truly staggering. The Public Enemy, Mutiny on The Bounty, Angeles with Dirty Faces, Captain Blood, The Sea Hawk, The Adventures of Robin Hood, Casablanca, The Hollywood Canteen, The Music Man, just to name a very few! And not only do these films have great actors but the musical scores to many of these classic motion pictures by two of the greatest musical talents to ever work in Hollywood: Erich Korngold and Max Steiner. Plus the Cartoon scores of the incredible Carl Stalling! This is truly an archive that has deep roots of greatness and deserves to be revisited and explored again and again. I watch at least one classic film a day, and regularly share my personal “top ten” list (which is actually 62 titles…and counting) with those who don’t yet know the quality and breadth of classic film. So many of those titles are part of the Warner Archive! It would be great to have access at my fingertips. What a great give-a-away!! I’d love to see some of the films that aren’t shown on TCM. That kind you for the opportunity! 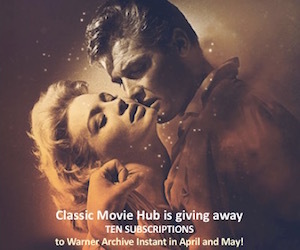 I would love to win a subscription to Warner Classic Instant as an avid classic motion picture lover. I love TCM; however, TCM does not show all of the classic pictures that I would like to see. I am thirteen and love everything vintage, from the 1920’s-1960’s, and sometimes from the 1900’s-1960’s. Watching classic films is a swell way to get back in the time period of the Golden Age of Hollywood, and I do so quite often, especially with my grandparents. When my grandparents and I watch classic films, we experience a priceless moment, because these are films my grandparents perhaps saw when they first came out, in the cinema, and films I’m seeing for the first time, with my grandparents. My favorite actress from the Golden Age is Judy Garland, and my favorite actor Mickey Rooney. I would be really grateful to win this prize so I can watch a lot of more classic films, which I adore! I would like to win a subscription to Warner Archive because they have a great selection of films. There are quite a few classic films that I haven’t seen. I would like to expand my cinematic knowledge with this subscription. Film is my passion! But there are a ton of older and classic films that I have not seen, and I need to catch up on them. Therefore, winning a subscription to the Warner Archive would be amazing! Wow. I can’t even start about how cool it would be to win a subscription. I miss being able to discover the old gems of Hollywood, and this would help out for sure! The classics often get overlooked nowadays, but being able to have such access to such great movies would help expand my knowledge of cinema. I’d love to win a subscription to Warner Archive Instant because I’ve been a fan of classic movies since I was a teenager. I’m only 30 but TCM is my favorite channel and I am much more likely to enjoy a movie made before 1960 than a modern movie. My friends say I was born in the wrong era and I agree! I’d love to have tons of classic movies at my fingertips from the Warner Archive!! Hi Kari, I don’t see your tweet, but it may be due to privacy settings. Could you please confirm that you tweeted? Thanks! The idea of having access to so many great movies would be amazing! Hi Desiree, I can’t seem to find your tweet. Could you please confirm that you tweeted – or let me know by commenting back here if you don’t have a twitter account. Thanks! I would like to win the subscription because I no longer have classic movies through my cable service provider. I only have the most basic service now which doesnt include any movie channels. It got so expensive that it was ridiculous. I miss thr classic movie channel so much. I kept it on the classic movie chann constantly. I used to sleep with the station on and wake up in the middle of the night and catch part of a movie that made me want to see the entire movie. Such amazing talent, creativity and history saved for posterity. Hi Benjamin, I can’t seem to find your tweet. It’s okay if you don’t have a twitter account, but please let me know by commenting back here if you don’t. Thanks so much! I do have a twitter account but I had problems posting the comment so just now seeing it went through. I will tweet now. I spend a lot of my time at home due to my disability. It would be great to win a Warner Archive Instant Subscription. I’d have hours of fun at my fingertips. Plus, I just love classic movies. Half of the stuff that’s being made now does not compare to movies of yesteryear. I would love to win a subscription because watching old movies is an addiction of mine and Warner Brothers makes my favorite genre (noir) and has my favorite actor of all time (Humphrey Bogart). Plus watching black and white movies just adds to the whole great feeling you get when watching the real classics. Thank God I discovered old movies. Every new (old) movie and star I discover is like opening a treasure chest. This would be amazing to win! I’m for the most part, disabled so I spend about 95% my time watching classic movies. There are so many I haven’t seen. this would give me a great opportunity. WB had so many great movies. Did you get my last entry for entering contest? I just don’t get enough classic movies in my diet. Too many empty calories from the endless parade of mindless superhero movies. Do I want this, yes, but I also need this. Excelsior! I have been a subscriber for a few years. They have a good selection of classic movies and TV series which seems to be getting better as time goes on! I’ve been able to watch some old TV shows I haven’t seen in years (or never saw in the first place!). Some great movies too. A free subscription would allow me to continue to watch all their great content for another year! I would LOVE to win this subscription because I am extremely passionate about classic films and their preservation. Most everyone who knows me, knows me as the old Hollywood film buff, and always comes to me for questions or suggestions when it comes to older movies. I was a really lonely teenager who spent most of my time watching TCM all night, and I loved every second of it. These movies are my eternal happy place, and it would be amazing to be able to see a lot more of them as I haven’t had cable since around 2006, and many movies are unfortunately hard to find physical copies of! The Warner Archive has a fantastic selection of movies to choose from, and I love getting to show my boyfriend older movies he’s never seen before. A subscription would make a world of difference because it would grant us the freedom to be able to watch them wherever and whenever we wanted. I cut my cable for about six years, and during that time I only ever missed Turner Classic Movies. The classic movie selections at Netflix and Hulu (which just lost the Criteria Collection to FilmStruck) are so limited. I would LOVE to get in on a free subscription! My submission says it’s still awaiting moderation. Is it ok? I can’t remember if I already entered or not?! UGH! Why would i like to win a subscription? Classic movies are the stuff of life. Frankly, they were done with such style and great writing that the never needed be graphic nor vile in dialogue in order to tell a good story. Between scripts, plots, lighting and art, classic movies took more effort and much more thought to produce, and do a good job of doing so. A lot of creativity of the human mind went into the classics. A lost art by today’s standards. I want a Warner subscription because it’s my favorite film studio. Universal made its name with classic horror, MGM with lavish musicals and prudish storylines, but ‘Warners’ did it down and dirty. Noir, crime and as close to real life as the Hays code would allow. ‘Warners’ spoke to the common man, the working class. For that reason, it’s films are also the closest thing to a prism into America’s past. I would love to win a subscription. Classic Movies have an elegance and wit that you just don’t see anymore. Whether opulent or simple, Classic Movies take you to another world. Even if I don’t win, I will continue to love Classic Movies. Good luck everyone! Because: Bette, Bill, Barbara, Cary, Clark, Franchot, Greer, Jean, Joan, Katharine, Laurence, Merle, Myrna, Olivia, James, Spencer and Vivien. Hi Steph, I can’t seem to find your tweet. Could you please confirm that you tweeted the message, or let me know here that you don’t have a twitter account. BTW all awesome reasons! I would absolutely love to win this prize. I eat, sleep, drink the movies and adore Classic Hollywood. Fingers crossed! I would like to win for one simple reason: I can share my love for classic film with my best friend and introduce her to some of the best movies ever made. It took me a year to get her to watch His Girl Friday, and I’m still working on Psycho! If I won a year subscription to Warner Archive Instant this would be the greatest way to watch all those wonderful classic movies filmed and preserved by Warner Brothers Studio. I have been a classic movie film fan since I would sit up late at night with my Grandma to watch old movies in the mid 70’s. Thank you for treating 10 fans to this wonderful opportunity. I would love to win this prize. It would be fantastic to win because I love all the old classics.I just enjoy finding new (old) gems.Nothing Hollywood is putting out today even comes close. I love watching all the old TV shows too.